The NWS in Birmingham has extended the Winter Storm Watch to include Bibb, Calhoun, Clay, Cleburne, Greene, Hale, Randolph, Shelby, Sumter, and Talladega. The other counties in the warning include: Blount, Cherokee, Etowah, Fayette, Jefferson, Lamar, Marion, Pickens, St. Clair, Tuscaloosa, Walker, and Winston. 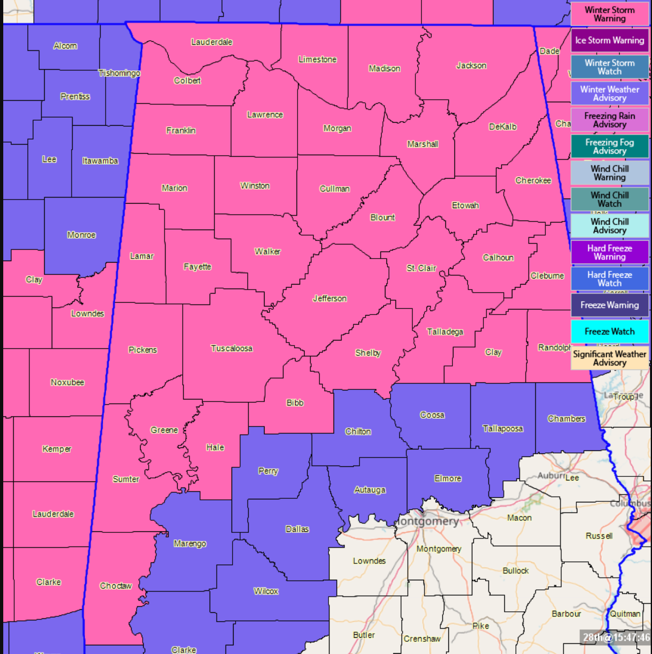 The Winter Weather Advisory continues for Autauga, Chambers, Chilton, Coosa, Dallas, Elmore, Marengo, Perry, and Tallapoosa Counties. The warning and the advisory are in effect until 12 noon CST on Tuesday.